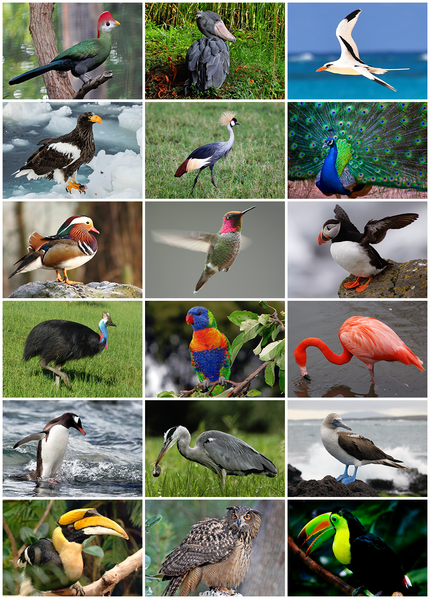 Representatives of various groups of birds. Young earth creationists would consider each of these different kinds and thus created separately from one another even if none of them looked like this in the original creation. Image from Wikipedia. The diversity of birds on earth is remarkable. There are more than twice as many bird species alive today as there are mammal species. A challenge for literal-day creationists is explaining how such diversity was either preserved during a global catastrophe not more than 4500 years ago or was formed after that event. Did Noah’s Ark hold all 10,000 species of birds and the 10s of thousands of species of birds that must have lived and gone extinct since the time of the biblical flood? Or was there a much smaller number of representative birds on the Ark that speciated – evolved – into all of the extinct and living birds? Answers in Genesis has opted for the second option. But how did this happen? Yesterday, another article appeared on the AiG website that describes how thousands of species of bird originated from a few common ancestors that were preserved on Noah’s Ark. This article builds on the previous work of Jean Lightner who I have responded to in the past. Below I take a quick look at Dr. Boyd’s new ideas and then I provide an updated version of my comments about Jean Lightner’s article on the birds of the Ark. Dr. Boyd teaches biology at the YEC-affirming Bob Jones University. His article, Bird Speciation from the Flood to the Present, includes one of the better descriptions of how species are defined that I have seen in the YEC literature to date. He employs standard evolutionary mechanisms to explain the speciation of birds kinds into the many different species we have today. However, as we have seen many times, he accelerates, beyond any observable and measurable rates, that process of speciation to account for the formation of thousands of species in a very short period of time. Dr. Jean Lightner has conservatively estimated that birds are comprised of about 196 created kinds. If we round that up to 200 bird kinds, we could account for all 10,380 extant species by each species diverging into two species just once every 750 years—just six times (200 to 400 to 800 to 1,600 to 3,200 to 6,400 to 12,800). That would even give us 2,420 more bird species to account for some extinction events. That is a very simplistic view and does not account for many variables, but it does provide us with a quick way to estimate if simple speciation (doubling) could account for all the birds we have today. He admits this is simplistic and he is right about that part. It is also very unrealistic. The 750 doubling rates is a very high estimate since we have good observations of birds over the past 750 years and the number of species formed in that time could probably be counted on one hand rather than the 6000 new species he predicts. The rate of speciation in the YEC model must be inverted. Since the observed pace of speciation is vastly slower than the YEC speculative model must predict that speciation rates were incredibly high in the past and then slowed to the pace observed today. Hence, the number of species must have initially doubled every decade rather than every 750 years. There is no genetic model, no genetic evidence, no written records, nor any other mechanisms that have yet been discovered that could account for such hyper-evolution. This is not the observational science that AiG claims is the only form of good science. Dr. Boyd also glosses over the biggest problem – extinct species. He suggests that speciation could have occurred at a fast enough pace to not only have formed all the species we see today but also could account for some extinction events. But he is under-estimating the problem here. Extinction of species accounts for many more species than are alive today. Just scan down this list of extinct birds from Wikipedia and recognize that this surely represents only a fraction of the species that are in the fossil record but have yet to be found. In general YECs do not acknowledge the vast diversity of past life and treat extinction as a rare event. Rather the extinct species present the larger problem for the YEC hypotheses than does the living (extant) diversity of organisms. For every “kind” of bird there are far more extinct species than there are living ones. Let’s take one example: the penguins. There are 18 to 20 species of penguins alive today depending on species definitions. But there are more than 50 extinct species identified in the post-flood fossil record. So there are twice as many species that existed after the Flood but went extinct than are alive today. And that only represents the species that have been discovered so far. To think that we have discovered even half of the extinct species from rocks in South America and Antarctica would be wildly optimistic. Just replicate this for every “kind” of bird and throw in many completely extinct kinds with no living species and the magnitude of the problem should become apparent. To suggest that bird species have doubled every 750 years is pure speculation of the very kind that YEC berate evolutionary biologists and historical geologists for every day. To top it is off it flies in the very face of the only records they believe are truly reliable – the Bible and other eye-witness testimony. I wrote a whole series on the Ostrich which makes this point. What we observe in written eye-witness testimony is that species 4000 years ago were not different than those we have today. But if birds were constantly adapting and speciating at the rates predicted we should see reports of these changes and we should read about many exotic birds and other animals that are now extinct having been replaced by the modern species that took their place. But this is not what the Bible or other written records tell us. Below is my response to Jean Lightners article from 2013 that I have updated and addresses all of the same things that Dr. Boyd discusses. There are about 10,000 species of birds alive today. Almost 200 additional species have gone extinct since the year 1500 and there are innumerable fossil species of birds in the geological column. One of the persistent challenges for modern young earth creationists is how to fit the diversity of life on the Noah’s ark. Answers in Genesis has published as series of articles by Jean Lightner of the past three years that have addressed the question: how many kinds were there on Noah’s ark? In the past decade creationists have developed a field of study they call baraminology which is the study of biblically defined “kinds” of living things. I addressed baraminology many times on this blog (eg. How Similar is Similar? Barmins, Species and the Identification of Common Ancestors). In brief, creationists attempt to determine how living things were classified in the Bible as a means of estimating of the total number of animals on the ark given that two (usually) of each kind were taken onto the ark by Noah. For example most creationists now believe that all canines including more than 20 living and more than 100 extinct species were represented by just a few individuals on Noah’s ark. Noah’s ark was the ultimate genetic bottlenecking event after which all species of foxes, the wolf, coyote, domestic dogs, African wild dog etc. evolved from those two ancestral individuals on the ark. 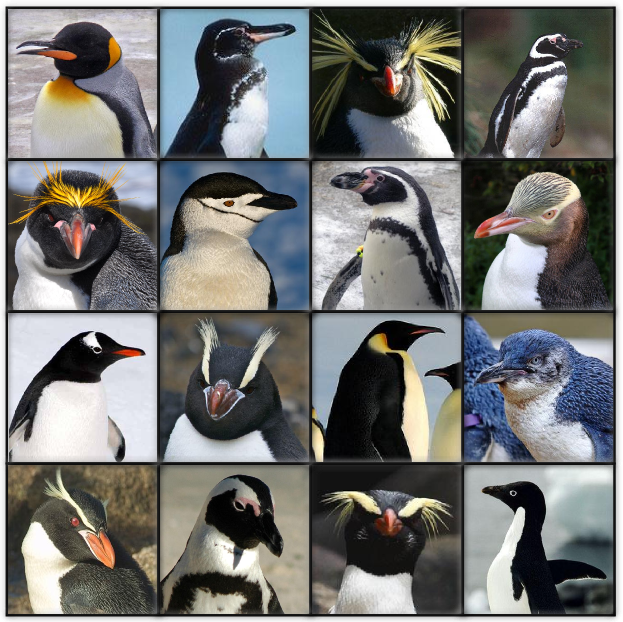 Pictures of most of the living species of penguins. Young earth creationists consider these all to be members of the same “kind” and thus all of these evolved from a common ancestor. Image credit: Wikipedia. This brings us to Lightener’s attempt to determine the number of birds on the ark published by Answers in Genesis. In her article entitled “An Initial Estimate of Avian Ark Kinds” Lightner tentatively groups all living birds into 196 Biblical kinds or baramins as creationists like to call them. The claim then is that 10,000 species alive today all evolved from these 196 original kinds within the last 4000 years. There is much that I have said about this sort of ultra-fast evolution in the past (How Similar is Similar and Thoughts on Baraminology) which I won’t address again here. I just want to highlight and comment on two quotes from her article that I found interesting. 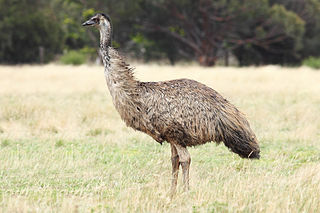 The first is in reference to two groups of flightless birds from Australia, the emus and cassowaries. They are relatively common in the fossil record. There is a fossil believed to be intermediate between cassowaries and emus (Cholewiak 2003b). Given this, the level of the kind could actually be higher, at the order or possibly above. Wild emu from Australia. Image from Wikipedia. So there is a possible intermediate fossil between these two birds. Sure sounds to me like an admission that missing links do exist. So how can she say this when young earth creationists (YECs) always insist that intermediate fossils don’t exist? The logic goes something like this: Lightner thinks that it is possible that these two birds could be part of the same biblical kind thus both would have only been represented by a single pair on the ark. Therefore they must have evolved a single original pair and so there must be intermediate ancestors. So YECs do believe in missing links and even expect that they should find them in the fossil record. 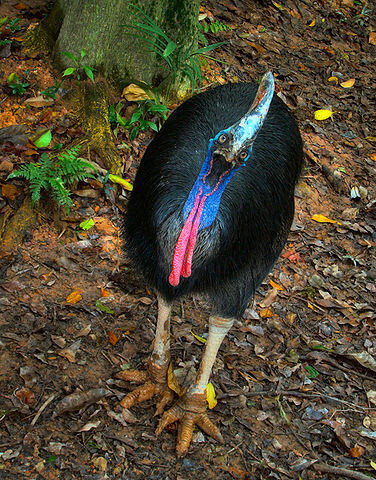 A flightless bird, the cassowary from Australia. Image from Wikipedia. So how do YECs know when to expect missing links? It is all based on their definitions of a kind. Intermediate fossils between foxes and wolves would be expected but a fossil that looks like an intermediate between a dog and a bear can’t exist (although there are plenty of such fossils) since the latter are members of different kinds that were created by special creation. YEC leaders consistently claim that no intermediate fossils exist and that there are millions of missing links between kinds but they use a set of definitions that apply only to creationists. Intermediate fossils are expected and are just ancestors in kinds but by definition they don’t exist outside of kinds. Since YECs think that there was no coyotes, wolves or a foxes on the ark but some sort of intermediate of all of them, the first canines would be expected to not be like any canines alive today and thus would have been an intermediate species. As they changed over time they should have left some traces of their ancestors which showed their evolutionary change from one morphology (shape) to another. YECs have a profound misconception of the nature of intermediate fossils as all intermediates are really between species not between higher levels of classification. There is no expectation of intermediate fossils between a living red fox and a coyote but there are plenty of fossils of extinct species of canines that lie along the ancestral chain of species that lead to either the fox or the coyote. I have written a whole series of posts (A Horse is a Horse of Course, A Horse is a Horse According to Answers in Genesis, and When is a Horse and Horse? A Species Definition Problem) on the YEC view of horse evolution in which I showed that among YECs there is disagreement about the horse evolution series. Some accept that all fossil horses represent a real evolution of the ancestral horse (a small dog-sized animal) that was on the ark into today’s modern species of horses. All those fossils that have been found are considered intermediates between that ancestor and today’s horses. Other YEC disagree because they believe that those fossil horses must be a different baramin/kind and thus by definition no intermediates can exist and thus deny the horse evolution fossil series and claim it has been misinterpreted by scientists. Since YECs think that there were no coyotes, wolves or a foxes on the ark but some sort of intermediate of all of them then the first canines would be expected to be unlike any of today’s canines. Likewise we see here that Lightner suggests that two bird might be able to hybridize which means according to baraminology rules they could be considered the same biblical kind of animal. Hyper-speed post-Flood evolution or special creation? However, perhaps the most astounding group identified based on interspecific hybrid data is Passeroidea. Encompassing Old and New World sparrows, various finches and related birds, this represents an amazing amount of variety in the nearly 1500 species. It is clear that this diversity didn’t arise since the Flood by the standard naturalistic explanations of neo-Darwinism, that is, chance mutations and natural selection (Lightner 2013)! Here we find that she is placing 1500 species of birds into one single kind. This means that there was only one species on the ark that has now become a whopping 1500 species. YECs use some amazing mental gymnastics that go on to explain how two dog-like individuals could contain enough genetic variation to become all the species of canines alive today including all domestic dogs. this absolutely defies all that is known about genetics. In this case Lighter seems to admit that natural selection and mutation aren’t enough to create all this genetic variety. So then how could 1500 species created from one species in 4000 years? All these birds started with just a couple of genomes and now there are thousands of variations of genes where there were there could only be a few in those birds on the Noah’s ark. Those new variations in genes either formed by mutation from pre-existing genetic information or God stepped in and created them in some new act of special creation. Lightner says it couldn’t be by any standard naturalistic mechanisms which implies some form of special creation. But her reference is to a particularly contorted genetic explanation having to do with meiotic genetic exchange which, although totally unrealistic and unsupported, is nonetheless an attempt at a wholly naturalistic explanation despite implying that naturalistic mechanisms won’t work. You can say you don’t think natural selection and mutation can explain the origin of all these species but if you come up with another genetic means of this happening you are just coming up with an alternate mechanism of evolution but it’s still evolution. If you are confused, you should be, I am too. YECs seem to be grasping at any straw they can to explain the enormous genetic variation that exists today while limiting the number of total individual species on the ark to a number, which is still unrealistically large, that could fit on the ark. Only 196 kinds of birds on the Ark? Lightner tentatively estimates 196 kinds of birds where on Noah’s ark. Because they are considered “clean” animals there could have been more than two of each possibly up to seven. Now 400-1400 birds is a LOT of birds but it is far fewer than 20,000+ if every living species had been represented. To Ken Ham and others this makes the animal situation more manageable. But Lightner is forgetting something. If she wants to estimate the total number of bird kinds she cannot ignore the fossil record. Clearly there are many more kinds of birds in the fossil record that represent groups of birds (eg. terror birds of South America) that lived after Noah’s flood (because the fossils are found in what YECs believe are post-flood sediments). There are several hundred named fossil birds many of which would have belonged to their own genus or family. So her 196 kinds would definitely be much higher if she considered the fossil “kinds” Wikipedia lists about 20 classes of extinct birds containing 100 identified species within those groups. These would all be birds that would not fit into any group that is alive today nor is there any historical evidence (reports in the form of descriptions or images) of their existence. They also list well over 500 extinct fossil species of birds that would be related to today’s modern birds. Lightner’s work seems to comfort many young earth creationists who have worried about how all those animals could fit on the ark. She has paired down the actual numbers to a small number of representatives. At the same time she has created a plethora of new problems. How did such immense diversity of life come to be after the flood from such a small gene pool? How could 1500 species of birds that are one “kind” and originate from 14 or fewer total individual birds be FAR more genetically diverse than the human population which is single species but was derived from 8 individuals? Similarly, how can foxes, wolves, coyotes, wild dogs etc.. which are as genetically diverse as chimpanzees from humans have evolved this much diversity from just two individuals!? How could all of this diversity have formed within just a few years after the flood and why are there so many fossil species that are different from today’s species? As I have pointed out many times in the past, good theories generally help to explain data rather than create more problems. Every time YECs try to provide a solution to a particular problem, in the case the problem of too many species to fit on the ark, they end up creating a large number of new problems. They have now been forced to accept a form of super-accelerate evolution by genetic sorting and strong natural selection while at the same time suggesting that natural selection doesn’t work. They are saying that intermediate fossils must exist while denying that they exist. Welcome to the wild and confusing world of creation science. There is another problem with hyper rapid evolution that I am not sure anyone has addressed. According to real molecular biological based theories of evolution, such rapid evolution would require an extremely high mutation rate to produce the huge variety of alleles that could allow for rapid evolution. But such high mutation rates are not seen outside of viruses, and would probably lead to the kind of error catastrophe that happens to viruses and some bacteria who use very high mutation rates as a survival mechanism. Such mutation rates have never been observed in any animals (the exception being tumor cells). YECs might claim this doesnt hold, since in YEC molecular biology, all possible alleles were already present in the original Ark kinds, and speciation results only from progressive loss of alleles. But that is also problematic, since the kind and frequency of allelic loss they would need to see, would have to be very carefully “guided” or designed for each individual new species in order to again avoid catastrophic failure. Lose the wrong allele and you’re dead. And of course, the main point is there is no evidence at all, (and there never will be) that Ark animals had the enormous functional genomes they would have to have had to make any of this possible. If all the birds on the ark were some sort of basal members of baramins, then how do you explain the presence of a dove and a raven? Exactly. That is better than my example of the Ostrich which is described in Job and seems to be the same as the Ostrich that we see today. The use of dove and raven certainly were to birds familiar to the Israelites, not some sort of proto-dove. Watching the Nye-Ham debate, Bill Nye mentioned that with the amount of ‘kinds’ meant to be on the ark compared to the amount of species alive today (and Ham then said that there were even fewer kinds on the ark than Nye thought, which just makes it a greater problem) there would have to be on average eleven new species arising each day. In reality it would start much slower than that and then speed up at an exponential rate, so rather than expect to see eleven new species appear today, we should expect hundreds. There’s also the question of why the animals described in the bible are the same as the ones we see today. If birds can speciate into 50 times the original kinds in 4,000 years, then surely in the 2,000 years since Jesus appeared we should have many more descendant species of camels and donkeys and pigs, rather than just a few breeds of each single species. We do indeed have lots and lots of species of camels, equids (like donkeys) and suoids (like pigs). Unfortunately 95% of them are now extinct. Any YEC explanation for why that should be the case? Whoops —- should have mentioned that the great majority of the extinct camels and equids are North American, where they are not found today as natives. Even more problems to explain that? I assume Creationists just hand-wave all ancient animal remains that resemble the modern species using the same language they dismiss all geological dating methods with. But I wonder what they make of, say, the ancient Egyptians, who over 1,200 years mummified and entombed millions of animal mummies? Those animals are no different from the modern species, and even the most obstinate fool cannot pretend the mummies are modern. Hi Joel, it seems like we’re facing a challenge here that this debate often confronts, which is that YECs are willing to suggest that biological mechanisms were not always the same in the past as they are today, while OECs or TEs will only accept explanations that use mechanisms that are known to function today. For example, I’m not sure that I’ve ever heard you say that accelerated evolution is flat out impossible, just that none of the necessary mechanisms have been demonstrated or observed. I’m OK with that sort of speculation (since I take genesis’ account of the flood to be literal, and thus in need of such a hypothesis), but you of course aren’t. You want to assume speciation rates, mutation rates and all other mechanisms function in the same way and at the same rate, and I simply find that to be needlessly restrictive (although I appreciate the desire to be data driven, I think speculation is also reasonable). So how do we deal with this impasse? Also, I’m not sure I fully understand the purpose of the dove/raven and ostrich arguments that you and Christine are making. Are you arguing that doves, ravens and ostriches looking the same now as they did on the ark proves that speciation is slow? If so, isn’t that sort of like the fallacious YEC argument that asks, “if we evolved from apes, why are there still apes?” Or in other words, “if speciation is so fast, why are there still doves? The non-human apes that are here today are not the same as any earlier forms, but are at the tips of the phylogeny, and the end result of multiple generations of branching since the common ancestors (at various levels). If the forms of bird that Noah took on the ark were the basal ones for whatever baramins the dove and raven have been assigned to, then they could not a modern dove or raven, because those are one of the end results of diversification within the clade. In order to arrive at modern types of any organism, let’s say doves and ravens, from some ancestral form there must have been a tremendous amount of branching speciation to produce the diversity of the entire radiation that has doves as one endpoint (along with all their extant and extinct relatives) and ravens as another (ditto). Before jumping back in, Trevor, I suggest you do a quick reccy of phylogenetics, as your question shows considerable naivite about this issue. But moving on, I’m well versed in all of the concepts that you described in your response, and actually none of what you said answered my question. I think what my fellow YECs don’t understand when they ask why we still have apes if we evolved from apes is that not every animal within a population will evolve the same (or at all) or go extinct. Therefore, if your conclusion about doves and raven is what I think it is, then I believe you are creating a false dichotomy. That is to say, rather than taking the existence of doves both now and on ark to mean there has been slow speciation (as It seems you are Joel were arguing; correct me if I’m wrong), its also reasonable to conclude that there has been quite a bit of speciation but some of the original species continued as they were rather than going extinct or diverging. The evolutionist conclusion is not the only one that makes sense here. No wonder these arguments don’t get anywhere. I don’t know anything about the details being argued here, except for one thing as it relates to birds (because my wife is a serious birder… she just spent a four day Mother’s Day weekend at the Colorado Field Ornithologists’ convention — THAT serious :) ). According to bird experts today, your statement is simply incorrect. There’s a lot of vigorous discussion about bird species… basically two camps: the splitters (recognizing true differences among species, and also discovering new species) and the lumpers (arguing that what were thought to be two species really are subspecies.) The “splitters” have been winning for a while. Last I checked, we’re closing in on 10,000 species. It is quite surprising how rapidly speciation can take place in bird populations. Hi, I’m not sure how this chart is supposed to be making your point. I see that many new birds are added but that doesn’t mean that a new bird being discovered means that it speciated from another and that is why it was noticed. I haven’t seen where these “new birds” are said to be new bird species that didn’t exist 100 years before. Splitters aren’t splitting becuase new species were formed recently but are recognizing species that already existed but where recognized based on previous definitions of how to resolve a species. OK, time to explain a bit about phylogenetics, and how scientists make inferences from phylogeny. Although it’s impossible for a living species to give rise to a range of other living species within a clade (or baramin), it is possible for a basal species in clade (i.e., the first branch off the phylogeny) to remain relatively unspecialized, and so appear the same millions of years later after cladogenesis results in the rest of the diversification. This is nothing to do with rate of speciation —- this basal branch might have a great deal of speciation, while retaining a generalized basal morphology. The degree of, and rate of, speciation is little to do with morphological diversification —– there are 30 species of mice in the genus Mus, for example, let alone numerous other muroid genera that look virtually identical to a common mouse. Orangs are the basal branch in the phylogeny. So, assuming that the common ancestor of pongids looked like an orangutan (which we know to be untrue, but never mind), it is not inconceivable that something like an orangutan was the ark-bound pongid. But it would be impossible for a chimp to be the ur-pongid that gave rise to the other apes —— it is too far nested within the phylogeny – at least two branching events (and many more if fossil forms like dryopithecids are included) happened before the arrival of chimps. So, if chimps were on the ark, orangs and gorillas would have to be as well. AIG recognizes the baramins Columbidae (for the doves) and Corvidae (for the ravens). 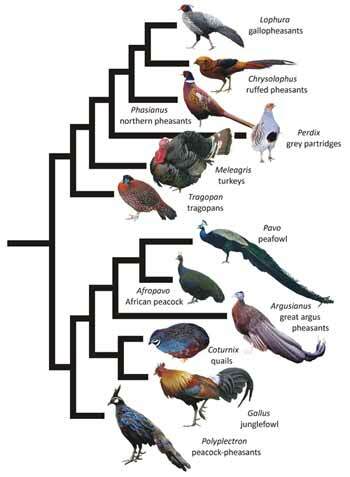 Now, if we look at columbid phylogeny (which also includes pigeons and dodos), there are lots of different genera called “doves”, that aren’t all that closely related within the phylogeny, including turtle doves, mourning doves, rock doves, ground doves, quail doves, etc. So it’s conceivable that a general basal columbid could be called a “dove”. So, there are at minimum 5 branching events that must take place before arriving at anything like a raven. It is inconceivable that a raven, or raven-like bird, was some sort of basal corvid, or that there could be a raven on the ark unless there were also choughs, nutcrackers, and a couple different types of jays and magpies. Excellent explanation. That’s not the argument that I thought you were making. Thanks for clarifying. Or the vast majority of birds stayed airborne all the time, landing on the Ark only to eat and rest. Makes as much sense as any. Yes. All bird species are actually descended from albatrosses. They just hyper-evolved – I mean speciated – after the flood. What is the issue with rapid speciation? That it is too unlikely or that it is biblically incorrect? Having a dove and a raven on the ark doesn’t necessarily mean that rapid speciation is false. The problem is a problem of categorization. Species and kinds are a set of categories. We need to think beyond categories to be able to understand creation and the Bible better. Why would rapid speciation require that there be only one kind of bird on the ark? There are many species of dove and many species or raven. Wouldn’t that mean that each of those could be a kind? Also an ostrich being mention in job simply means that probably an ostrich was also a kind preserved in the ark. Not rapid speciation is false. My back yard was flooded last year and all our plants died. Two months later, our yard sprouted every kind of grass and week and looked like a dense jungle. When life is threatened, it seemed to spring back up in full force and full variety very quickly if allowed . We only recently(in human history) even learned about evolution, yet we think we know everything about how it functions. As theists we should always also consider the will of God above human theories and thoughts. Even in our own age we have seen rapid overthrowing changes in human intelligence and cognition and our technology. Sometimes change happens at an exponential rate like we have seen in our recent tech history. Who’s to to say that mechanism like natural selection can’t have rapid exponential rates of change if conditions allow?